A French chef who had shocked the culinary world by handing back his Michelin stars was stunned Monday to find himself back in the prestigious guide's new edition. Sebastien Bras cited the "huge pressure" that came with Michelin recognition when he asked in September 2017 for his three-star restaurant Le Suquet to be left out of the 2018 guide. Bras spent the following year rustling up inventive French cuisine at his restaurant in the town of Laguiole, in the rural Aveyron region, without worrying whether it was meeting Michelin's exacting standards. "You're inspected two or three times a year, you never know when," he told AFP in 2017. "That means that every day one of the 500 meals that leaves the kitchen could be judged." Stephanie Le Quellec won a second star for Parisian restaurant La Scene, while 24-year-old wunderkind Julia Sedefdjian won her first for a new restaurant Baieta. In one of the biggest shocks, star Alpine chef Marc Veyrat lost his third star, along with the Auberge de L'Ill, a restaurant in Alsace that has held three stars for 51 years. "It's hard for the team, it's hard for everyone -- the customers, the family," its chef Marc Haeberlin told France 3 Alsace television. Veyrat, known as much for his ever-present wide-brimmed black hat as his love of mountain herbs, confirmed that his restaurant the Maison des Bois had also lost its third star. "I'm terribly disappointed. I can't understand it at all," said Veyrat, who earned the coveted third star only last year. "I will stay combative and stand by the team in my kitchen," Veyrat said, blasting the decision as "unfair". A record 75 restaurants have earned new spots in the one, two or three star rankings for 2019. "It's a reflection of the great dynamism of French gastronomy, in all regions, with establishments set up by talented young people who are often entrepreneurs who have taken risks," Poullennec said. A large number of international chefs are also honoured -- many of them Japanese -- while Argentine Mauro Colagreco became the only foreigner to currently hold three stars in France. "So many emotions. Thank you! 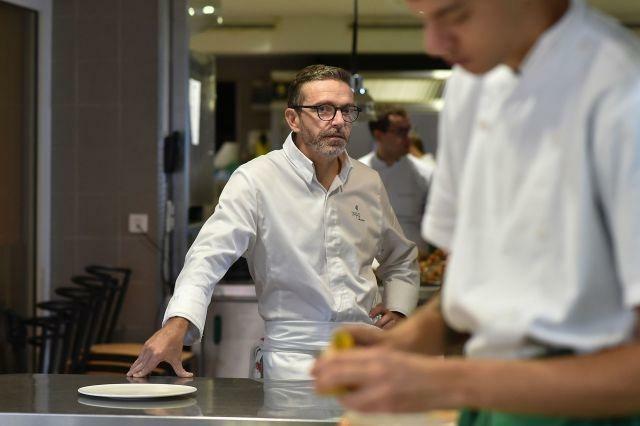 I'm so honoured," said the 42-year-old, whose Mirazur restaurant on the glitzy Cote d'Azur ranked fourth last year on the World's 50 Best Restaurants list. "I'm delighted to have won a third star with endive roots and a cabbage tart. Simple, simple, simple," he said.